Earth Day Run 2016 Takes Environmental Race to 5 Countries! 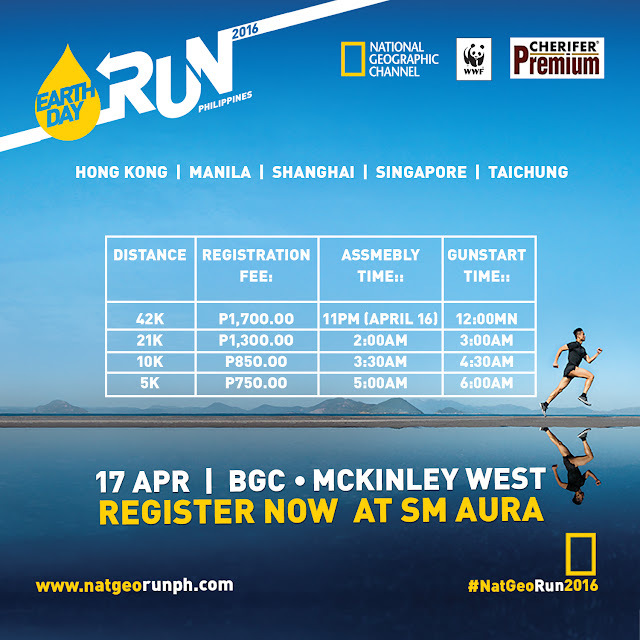 Considered one of the biggest and fastest-growing running events in the Philippines, National Geographic Channel’s Earth Day Run will be going international when it marks its seventh year on April 17, 2016. In celebration of seven years of promoting fitness and caring for the environment, Earth Day Run 2016 will be happening simultaneously for the first time in five cities across the region: Singapore, Hong Kong, Shanghai, Tai Chung, and Manila. Each city’s race will be using support from the registration of all participants to help raise money for World Wide Fund for Nature and its projects. 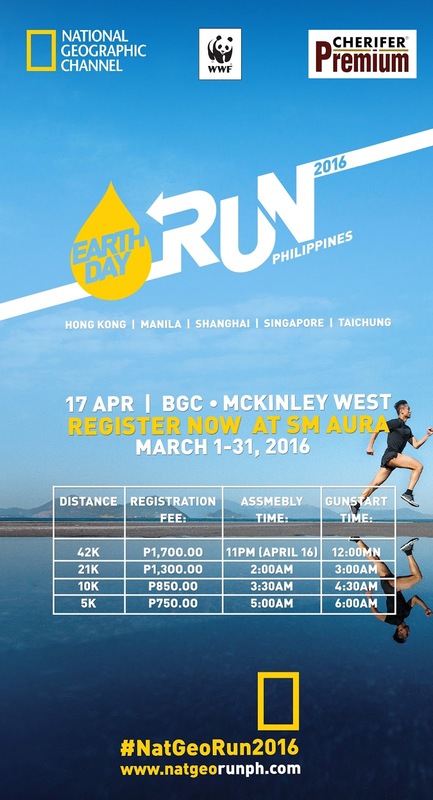 On April 17, Earth Day Run 2016 will be held in all cities, with the Manila leg expecting 20,000 runners to participate in a race course that spans Bonifacio Global City and McKinley West. NGC will once again partner with Cherifer Premium to help make the Manila race its biggest Earth Day Run thus far. Combined with thousands of runners from the other cities, Earth Day Run 2016 will be the largest collection of running Eco Warriors in the history of the race. Massive participation in Earth Day Run throughout the years has made it possible for NGC to plant 36,000 fruit-bearing trees in a watershed in the Abuan watershed in Isabela, in the Sierra Madres region. Not only was the watershed partially reforested but local farmers were also allowed to care for and harvest these trees for themselves. In 2014, Earth Day Run’s proceeds went to training fishermen affected by Typhoon Haiyan (Yolanda) on how to make and use fiberglass boats, which can better withstand the hard weather common in the Philippines and allow them to continue with their livelihood. Last year, NGC was able to provide portable solar-powered lighting kits to the Tawbuid Mangyan tribesfolk in Mindoro, giving them and Forest Rangers’ camps safe and sustainable light sources off the grid. Earth Day Run 2016 expects to register 20,000 runners this year, and slots for 5K, 10K, 21K and 42K are open via online registration through the regional site http://www.natgeoearthdayrun.com, which leads to the Nat Geo EDR sites for each country. On-site registration for the Manila leg will be open until March 31 at the Ground Floor of SM Aura Premier in BGC. Kaya pa humabol :) till March 31 pa!